This year’s presidential keynote lecture at the Eastern Sociological Society’s annual conference was given by Nancy Foner, Distinguished Professor of Sociology (CUNY). 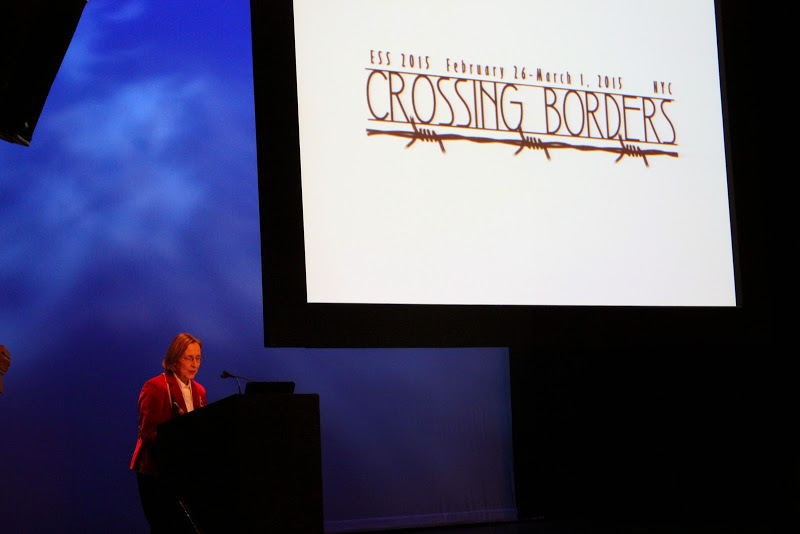 The conference theme was “Crossing Borders,” and Foner took up the question of whether or not Islam in Europe is similar to race in the United States. As a scholar who studies the racialization of Muslims in the United States, I was eager to hear what she had to say given her expertise as an immigration scholar. In my work, I argue that in a post-9/11 society we need to examine the experiences of Muslims as racial in nature. This requires scholars to come up with newer ways to examine race that reflect the political, cultural and economic contexts within which we live in. Fortunately a growing number of scholars are doing the work of re-theorizing race, reflecting the fact that race shifts over time and is fluid rather than a static/rigid concept. For example, Eduardo Bonilla-Silva argues in his Latin Americanization Thesis (pdf) that the United States has moved from a bi-racial system to a tri-racial one. Bonilla-Silva argues that due to the passage of the Immigration and Nationality Act of 1965, the racial classification has changed in the United States from a black and white one to one that includes collective blacks, honorary whites and whites. This framework makes space for an understanding of how various racial and ethnic groups experience race and racism differentially due to a myriad of factors aside from just skin tone, delving into the complexities of race in the United States. Unfortunately, Nancy Foner’s analysis of European Muslims to “color-coded” race in the United States did not provide that complex analysis of race required to understand the connection of immigration and religion to race. Instead, Foner’s talk highlighted how race is perceived in the United States. Many people, including scholars, think race is limited to skin tone. The need to equate someone’s racial experience with African-Americans limits an understanding of race to a black and white paradigm. It ignores the intersecting factors that contribute to the social construction of racialized identities, such as language, clothing, nation of origin and religion. It also assumes racial experiences do not change over time. For example, African Americans’ experiences with racism have changed over time, partially due to the passage of the Civil Rights Act of 1964. While we do not live in a post-racial society, as some may claim, racism has changed over time. Michelle Alexander’s book The New Jim Crow examines how mass incarceration is a new system of oppression that strips African-American men of their basic rights. By chronicling laws and policies put in place that have resulted in the hyper-incarceration of African American men, she finds the system of Jim Crow is still alive and well. Racial projects shift and change over time. In a similar way, anti-Muslim sentiments and Islamophobia has shifted over time, particularly since 9/11. Anti-Muslim sentiments spiked immediately after 9/11 and then declined. But in the decade since 9/11 public opinion toward Muslims has increasingly gotten worse, especially with the continuous coverage in the media of Muslims as terrorists. Muslim experiences with racism must be understood within the context of 9/11 and the War on Terror. In a post-9/11, discrimination against Muslims has risen in the United States. A Muslim religious identity has become racialized as a threat to national security and as a consequence they are subjected to increased surveillance and are denied the privileges with citizenship. For example, policies like the National Security Entry Exit Registration System (NSEERS) required non-citizen men aged 16 and over to register with the state. Out of the 25 countries on this list, 24 are Muslim majority. Although this policy has been deactivated, its impact on Muslim immigrants lingers. Anti- Muslim sentiments do not just impact immigrants. Muslim Americans are also treated as suspect. They have been repeatedly stripped of their civil rights privileges associated with citizenship such as being viewed and treated like loyal members of society. Instead they are treated as a threat to national security and endure hyper surveillance in places like U.S. airports. Nancy Foner has written that in the United States religion provides a pathway to integration for new immigrants while in Europe it can be a barrier. She and her co-author argue for Hindus in the United States, religious spaces have provided new immigrants with access to certain resources, such as language instruction and assistance with jobs creating a path to Americanization. In countries like France, Islam is treated as a barrier to integration. But while Muslims in France face harsher forms of discrimination through policies that prohibit their religious practices in public spaces, this does not mean that Muslims in the United States are exempt from racial experiences. In this new era of the War on Terror where the United States is increasingly becoming a surveillance society, Islamic religious institutions have become a site of surveillance rather than a path to integration into the American landscape. Life for Muslims in the United States has changed drastically due to a changing political structure that is hyper concerned with security both internationally and domestically. As a result, the state has contributed to the social construction of a Muslim enemy resulting in Muslim bodies being racialized as a threat to national security and are treated as such. Vilna Bashi Treitler makes a persuasive argument in “Social Agency and White Supremacy in Immigration Studies,” that immigration scholars fail to ignore the structural constraints immigrants face in society and offers racialization as a better model than assimilation to understand the immigrant experience. Treitler’s article highlights how integration is not always possible due to structures that are racialized and reject certain groups from gaining access to resources. This study provides a much-needed response to immigration scholars who fail to understand the restrictions and barriers faced by immigrants due to structures that are racialized. So, even though one immigrant group may enjoy access to financial resources, this does not mean they avoid racism all together. Furthermore, racism needs to be understood contextually. Japanese experiences with racism differed during internment due to World War II than they do today. In a similar fashion, Muslims are increasingly experiencing more prejudice and discrimination due to their religious identity than they have in the past. Finally, not all racisms are equal. Experiences with racism and its impact are varied. In other words, racism is fluid. Nancy Foner’s keynote address created a space for more discussion around religion, immigration and race. While I do not argue Muslim has become a new race, their religious identities have acquired racial meanings associating their bodies with terror and violence resulting in their increased experiences with racism. There is much room for debate and discussion around these ideas and hopefully scholars of race will start to engage with the complexities of race as it relates to religion, immigration and gender rather than compartmentalizing each one. ~ Guest blogger Saher Selod is Assistant Professor of Sociology, Simmons College.